Tyler Saladino went 1-for-3 with a double, a walk, and a run scored in the Brewers' 6-1 win over the Nationals Monday. Saladino has started at shortstop for the Brewers in every game since they've returned from the All-Star break. He has moderate power and speed and is a good option in NL-only leagues. Tyler Saladino went 2-for-4 with two singles and a stolen base in the Brewers' 7-3 loss to the Pirates on Friday. It was only the second steal of the year for Saladino, but he's shown the ability to run in the past. Saladino has had two 30-plus steal seasons as a professional and stole 11 bases in 93 games with the White Sox in 2016. He could definitely chip in the occasional steal while serving as the Brewers' starting shortstop, and that makes him valuable in deeper Roto leagues. Tyler Saladino went 1-for-4 with two RBI in the Brewers' 8-4 win over the Marlins on Tuesday. Saladino singled with the bases loaded to score a pair. Saladino has started 5-of-6 games at shortstop for the Brewers since returning from the disabled list, and looks to be their starting shortstop. That gives him value in NL-only leagues. Tyler Saladino went 1-for-2 with a single, RBI, and run scored in the Brewers' 7-2 win over the Braves on Thursday. Saladino started at shortstop after missing over one month with an ankle injury. He's hit well in limited playing time this season with a .319/.360/.574 slash line in 51 PA. Saladino could carve out some playing time for himself at shortstop for the Brewers, who have struggled to find steady offensive contributions from the position all season. Milwaukee Brewers utility man Tyler Saladino is headed to the disabled list with an ankle sprain, Adam McCalvy of MLB.com reports on Twitter. X-rays on the left ankle came back negative, by he is nevertheless headed to the disabled list. Saladino has performed well when called upon this season, sporting a .311 batting average with three home runs in 45 at-bats. 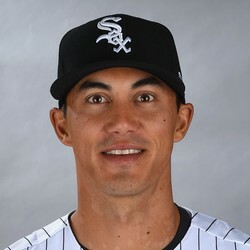 He is a classic example of a player who is more valuable to a major league team than he is in fantasy, but he will no longer be a cheap option for DFS players looking to optimize their lineups on days Saladino plays, at least for the next couple weeks.